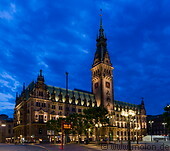 At night Hamburg is very scenic, due to the multitude of waterways and canals and the illumination of the buildings. The richly decorated town hall was completed in 1897. It is a building in Neo-Renaissance style, with a 112m tall central tower. Its 111m long façade is decorated with statues of emperors of the Holy Roman Empire, since as as a Free Imperial City, Hamburg was only under the sovereignty of the emperor.